While the rapture does not appear in the Bible, the event is described in 1 Thessalonians 4:13-18 and 1 Corinthians 15:50-44. At the time of the Rapture, believers who have died will have their bodies resurrected and, along with believers who are still living, will meet the Lord in the air. This will all occur in a moment, in a twinkling of an eye. In short, the Rapture is the return of Christ in the clouds to remove all believers from the earth before the time of God’s wrath. The Rapture is typically associated with events of the Second Coming of Christ, when Jesus returns to defeat the Antichrist, destroy evil, and establish His millennial kingdom. While the Rapture and the Second Coming of Christ are similar, they are separate events. Both involve Jesus returning. Both are end-time events. However, it is important as believers that we recognize the differences. Here are six things every Christian should know about the Rapture. The meaning or definition of Rapture is the idea that the coming of Jesus will take place in two separate stages. The first will be a secret Rapture – or carrying away of the saved to heaven – at the beginning of a seven-year period of tribulation, during which the antichrist will appear. The second phase occurs at the close of the time of tribulation when Jesus will return to Earth in triumph and glory. 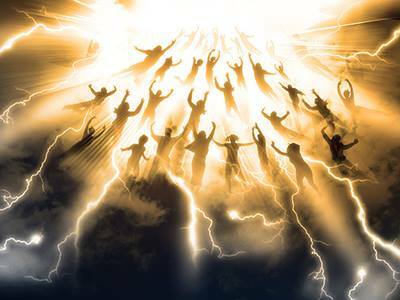 At the Rapture, the Lord will descent bodily in the air for his saints, both for the dead and for the living (1 Thessalonians 4:16-17) which will be seven years prior to the Revelation of the second stage of His coming. In the first stage of the Rapture, the Lord comes for His church; whereas, at the end of the tribulation period, He comes back with His church. At this event “every eye shall see Him” although at the Rapture he will come “as a thief” and only believers will see Him. There will be many people who will claim to be the Messiah and also claim to have the answers for a troubled world – and potentially the Rapture. In Matthew 24, Jesus gave a warning specifically for our generation. In this passage Jesus, speaking to us, warns us that false prophets will rise and show great signs and wonders to deceive, if possible, even elect. These false prophets are not working with sleight of hand illusions. We must be on guard and ask ourselves who these sinister false prophets and messiahs are. The Bible warns us that these are no ordinary men. In the End Times, people will be crying desperately for leaders to deliver them, and they will seek mystics and religious leaders who claim to have deeper knowledge. A major sign of Christ’s return is war and dissension among groups of people which is something we see happening right now. The book of Revelation tells us that the Tribulation Period is filled with war that will escalate until the world is involved. This war will be terrible, ceaseless and unending. The Bible says that as we move toward the End Times, there will be many talks of conflicts, border skirmishes, race wars and national battles. World military spending has now reached one trillion dollars. The arms trade is a big business. The question as to whether or not this means we’re preparing for the Rapture is something that is constantly debated. As we get closer and closer to the End Times, there will be devastation, including hunger and famine. If you look around the world right now, there are millions of people you will seeing who are going hungry, despite God blessing us with a fertile, abundant planet. There will also be earthquakes which science has projected will happen and the spread of new diseases. We have noticed an epidemic of new diseases breaking out that we have not been able to control the spread of. Many wonder what all the world’s current devastation is telling us? Christians wonder whether or not this level of devastation is warning for the rapture. We should avoid determining a date and time for the Rapture. Despite many attempts throughout the years to calculate the date, the truth is we cannot calculate the day Christ will return because God specifically chose not to reveal this to us. When Jesus was asked about the apocalyptic time by the apostles, He replied. “It is not for you to know times or seasons which the Father has put in His own authority. But you shall receive power when the Holy Spirit has come upon you” (Acts 1:7-8). Only God knows the date, the time and the hour, and only God knows when time will run out. During the rapture, Christians will come before the Judgment Seat of Christ. The purpose of this seat is to examine a Christian’s life. The Bible tells us, “For we must all appear before the judgment seat of Christ, so that each one may be recompensed for his deeds in the body, according to what he has done, whether good or bad” (2 Corinthians 5:10). The term used here refers to a summing up and estimation of the total pattern of a believer’s life. The overall focus of this should keep us from worrying over every small things we’ve ever done, or thoughtless sin we have committed. It’s a time of reward, not punishment. Though we won’t be condemned for our sins, our present lives do affect what will happen at the Judgment Seat of Christ. It’s important that we pay attention to the Bible’s prophetic passages and study God’s plan for the future. Though we won’t know the date, time or hour of the Rapture and Jesus’ Second Coming, we can be cognizant of all that is going on around us so that we are living the life God intended for us in Christ. When we study and understand the Rapture, we will be better prepared for what is to come. Thoroughly understanding these biblical mentions will help us, as Christians, be more aware of our time on Earth and appreciative of the opportunities we’re given in life by our Lord and Savior.